I have created a test setup for exchnage 2010 before going for a live server for organisation. The whole setup is running on VMWARE servers, (One AD, Two Exchange server (for testing DAG) and one windows 7 cleint. Everything was working fine. 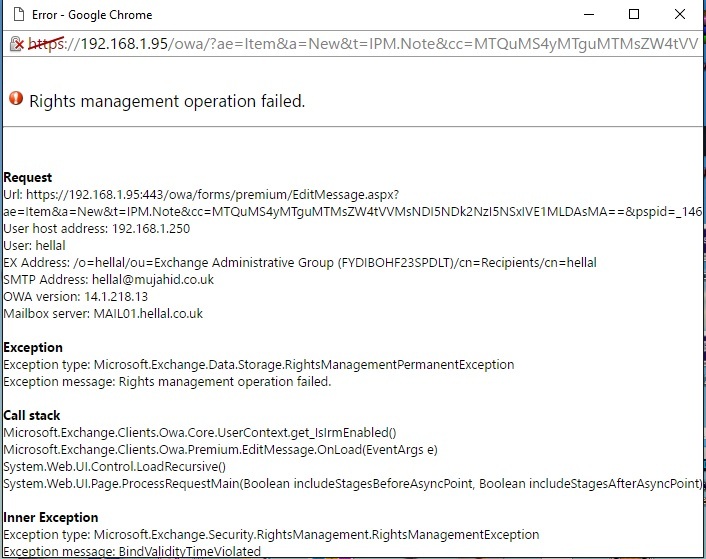 Exception message: Rights management operation failed. Please try the following steps to fix the issue. 2. Execute the following commands. You may find IRM is True. 3. We may have to turn it False , by the following command. 4. Execute the following commands.You may find IRM is True for OWA. 5. We may see the We may have to turn it off by the following command. 6. Execute the following command to Reset the IIS. 7. Try the OWA again. reviving an old post if someone can help. Run "Get-OWAVirtualDirectory | FL" and search for IRM; you'll probably see that it's enabled. Now reset IIS and try OWA again.